The mission of the department is to collect, distribute, analyze and report data in order to build the capacity of schools and departments to improve the achievement of all Hampton students. We are responsible for all division-wide testing, survey administration and analysis, research studies and program evaluation. We collaborate with schools and departments in providing the Hampton community with a high quality educational program. Research: Information on conducting research, or research training. Planning: Information on data available for planning purposes and how to get it. 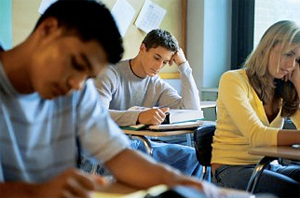 Evaluation: Information on our testing programs and schedule and surveys conducted. Whether you are conducting your own scholarly research or need help in navigating available data, we’re here to help. Contact Linda Dietz at 727-2233 to get started with a project, schedule training, or request resources. Contact us to request data. We provide three major services in EVALUATION. Assistance in identifying outcome measures for program performance. Benchmark Tests are quarterly subject tests given to students in grades 2 through 11 in Hampton City Schools. The tests give us measures of student progress in the four core content areas and help our instructional staff identify needs for extra help in specific skill areas. The NNAT (Naglieri Non-Verbal Aptitude Test) and CogAT (Cognitive Aptitude Test) are given to first and second graders, respectively, to help identify giftedness. Whether you are a student, parent, employee, stakeholder, or community member, your voice matters! Your feedback provides valuable information for our decision making process in evaluating and developing quality schools with excellent instructional programs efficiently using available resources. HCS regularly administers Student & Staff Climate surveys, Parent, Title I, Gear Up, Gifted Program, Mentor surveys, and PBIS Benchmarks of Quality. Contact Linda Dietz for information or assistance in survey development or schedules. Great programs are built upon SMART goals. We will assist you in selecting appropriate instruments to measure program effectiveness and success. Contact Linda Dietz for assistance.